After opening with a 3-0 sweep of Arkansas-Pine Bluff, USD volleyball dropped matches with Central Arkansas and Little Rock at the Central Arkansas Invitational in Conway, Ark. Friday and Saturday. USD’s swept Arkansas-Pine Bluff in their first match on Friday with set scores of 25-16, 25-17 and 25-21. The match was the first after an undefeated SD Classic last weekend, including a win over California of the Pac-12 conference. Senior outside hitter Hayley Dotseth led the Coyotes with 12 kills and 14 digs. Senior middle blocker Taylor Wilson added seven kills and a pair of aces. Junior Elizabeth Loschen contributed seven kills and redshirt-freshman Madison Jurgens racked 32 assists. Junior libero Anne Rasmussen tallied 13 digs and seven assists and redshirt freshman Emily Grathoff added six kills and two blocks. They also notched seven aces as a team, compared to only two for Arkansas-Pine Bluff. 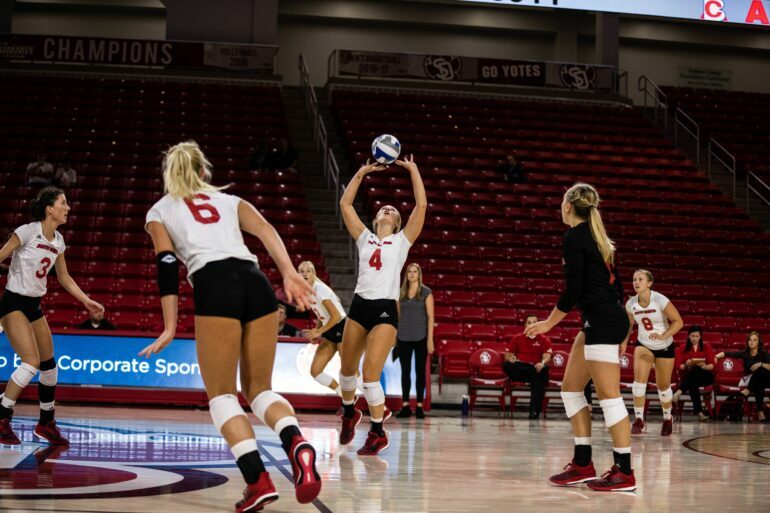 USD was on a six-match win streak entering its second match of the invite against Central Arkansas. The streak came to a halt as the Coyotes dropped three sets, 17-25, 22-25 and 22-25. The loss marked the first for USD since the season opener against Northwestern at the Panther Invitational in Milwaukee. Dotseth again led the Coyotes in kills with 11 and added 10 digs. Jurgens tallied 31 assists and Rasmussen 15 digs. USD struggled to convert offensively, held at a .178 hitting percentage. In comparison, Central Arkansas finished the match at a .346 hitting percentage. Wilson and senior outside hitter Kristina Susak finished with eight kills apiece. Susak also contributed seven digs. Loschen tallied six kills and two blocks. Each team notched four aces. Saturday’s lone match was a hard-fought four-set loss to Little Rock. Set scores for this match were 18-25, 26-24, 21-25 and 21-25. USD’s attack was limited even more in this match, as their 45 kills and 28 errors resulted in just a .090 hitting percentage. Dotseth led the attack with 16 kills and added 20 digs defensively. Loschen contributed 13 kills and Wilson nine kills and two blocks. “We have had a lot of success up to this point in the season and no one is going to take us lightly going forward,” Williamson told GoYotes. Jurgens tallied 36 assists and 10 digs for the Coyotes, who fell to 6-3 overall with the loss. Redshirt junior Lauren Sauer led the match with three of USD’s seven aces. Rasmussen added two aces to her team-high 24 digs. USD will finish up non-conference play in Bakersfield, Cal., where they will play UC Santa Barbara Sept. 14, and Montana CSU Bakersfield Sept.15.